My wife’s beloved grandfather was fond of pronouncing that “The world is going to the dogs!” With advancing age, and especially in this year, I’m tempted to entertain the notion that the old man just might have been on to something. But then comes along another fine recording of the St. Matthew Passion, and it dawns on me that there may yet be some lingering hope for humanity. I do not mean to imply that the fate of civilization rests in the hands of Frieder Bernius, but he does play at least a small part in it. This is a very good rendering of Bach’s masterpiece. It’s not quite the Platonic ideal of it—if that does or can exist—but it’s eminently satisfying, nonetheless. Bernius’s direction is nicely paced, not overtly theatrical, but consistently engaging. I may have occasional issues with some ancillary soloists, but the principal cast is splendid, especially the Evangelist, Tilman Lichdi, who also sings the tenor arias. Sophie Harmsen’s “Ebarme dich, meine Gott” is one of the highlights of the performance. But they are not alone. The multiple choruses, too, are excellent. Ah, the choruses! 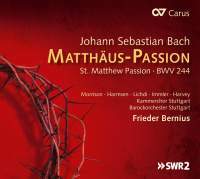 In a personal note, Bernius writes that he’s had a lifelong connection, singing in and conducting, the St. Matthew Passion, but it wasn’t until the historically-informed practice came into its own that he felt he had a grip on how to present it. He did reject all-male voices, but he embraced the sound of period instruments. And he accepted the concept of one-to-a-part ensembles, but discovered that in practice “it resulted in a lack of potential dynamic contrast.” So his choruses (two, remember) for this recording number 16 and 14 voices. The recording has a cathedral ambience, not a closely miked one, which seems appropriate for this performance. Bach heard the St. Matthew Passion four times at most. I’ve heard it innumerable times, overwhelmingly thanks to recordings. It still has the power to move listeners. That’s what’s saving civilization is all about. And that’s what Bernius has achieved.